I have visited the cemetery at St. Joseph Catholic Church many times, but while perusing one of my favorite genealogy sites, Find a Grave, I noticed something new. A plaque located on the altar of Our Lady of Lourdes Grotto at St. Joseph Catholic Church in Randolph, Portage, Ohio, is pictured on this site. 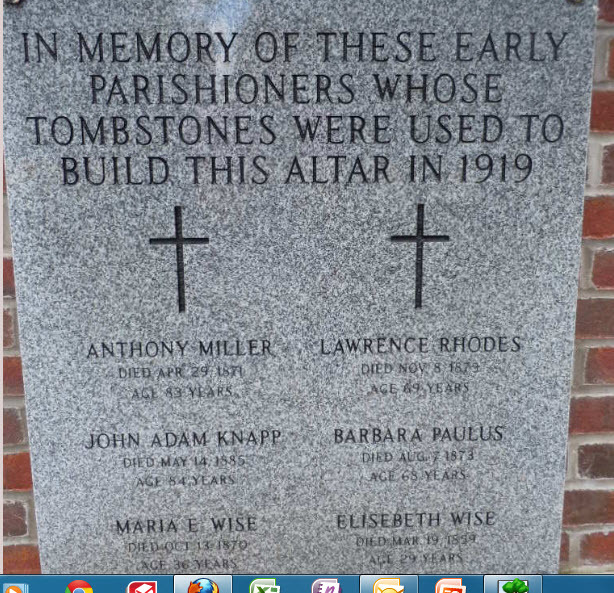 The plaque lists six early parishioners whose tombstones were used to build the outdoor altar back in 1919. Nancy Maryann KNAPP, who married John Lewis TRARES. Elizabeth KNAPP, who married Nicholas HORNING. Eva KNAPP, who married Joseph PAULUS. Peter KNAPP, who died at the age of 20 and never married. Rosina KNAPP, who married Bernard WISE. Margaret KNAPP, who never married. Mary KNAPP, who married John J. WISE. John Adam KNAPP died 14 May 1885 in Randolph Twp., Portage, Ohio. I have been trying to learn more about how the decision to use tombstones to build the grotto’s altar came about in the first place. It is reasonable to assume that marble and/or granite was costly for a small rural parish. A thrifty option was recycling the stone from tombstones. Someone in the KNAPP family must have given permission for his tombstone to be used for this purpose. It was not his wife, since she had preceded him in death in 1871. And it wasn’t his son, Peter KNAPP, either. He died in 1860. It must have been one of his daughters, possibly Margaret. Margaret never married and took care of her father after her mother’s death. John Adam KNAPP lost his eyesight in his later years. The original family homestead passed into the hands of his daughter, Nancy Maryann KNAPP and her husband, John Lewis TRARES and later passed into the Paulus family by way of Frank W. PAULUS, a grandson, son of Joseph PAULUS and Eva KNAPP, who added modern comforts to the homestead such as running water, heat and electricity. Also listed on this plaque are the names of other relatives, from the PAULUS and WISE families. I will write about them in my next series of posts. This entry was posted in Andes, Knapp, Local History, Ohio Churches, Paulus, Portage County, St. Joseph Randolph, Trares, Wise and tagged John Adam Knapp, Paulus, Trares, Wise. Bookmark the permalink. Hello, I grew up in St. Joe b. 1949 and asked my grandparents many times about why they moved the graves etc. To the best of my memory (from stories old grandparents and other people) in the old days the cemetery came out fairly close to the road. The hill was higher and steeper than it is today as it was leveled off on the top by scraping dirt down the hill from the top. I recall that I was told that there were erosion problems and some of the older graves were in danger of being exposed. I was told that many of the families who had ancestors buried there didn’t like the idea of the graves being moved, but I guess it had to be done. They moved the graves, leveled off the top of the hill (that had a sharp peak) and put the concrete stairs in all about the same time. Not all of the graves that were moved were destroyed, for instance one of my ancestors Martin Bissler’s grave and family plot was relocated to a plot at the highest portion of the cemetery in the easternmost row. I vaguely recall stories that some of the old wooden coffins were rotted away. I never found out how many graves were moved, and am not sure there are records for that. And that’s the way I remember it. Thanks for sharing your memories with us! I had no idea they leveled off some of the hill. It is still a bit steep; I can only imagine what the cemetery looked like way back when. It must have been a really big hill. Can you imagine what the poor pallbearers must have gone through if they were burying a large person? But I guess people were a lot tougher back then! Also it is not near the Lourdes grotto. It is to the east of the grotto. It is part of the vet’s area.,Inbeteen the west/newer graves and east/older graves towards the back. The Lourdes grotto is right behind the church area. p.s. They way I found my Great great great Grandfather was to ask in the office if he was buried in St Joseph’s cemetry. Then they told me the story of the memorial for the vet’s who served in the war in the Portgage county area. And she told me that they tried to find family and had it recorded that they had. I felt like hit the jack pot when I found it! My mom didn’t even know he was there. I was the one who found and posted the grave in findagrave.com. In the records they said they tried to contact relatives but never heard back or got permission. So these where the people they could not relocate. So they are still under the big cross! They relocated graves of others buried in the area if they got permission.